• The man who asked me to address a crisis-pregnancy center fundraiser in the Midwest. On the way to dinner, we dropped by a warehouse where he and other Catholic volunteers collected and distributed every imaginable kind of household good so that poor and immigrant families, single parents and people just released from prison could “shop” for free for their new lives. In one aisle, a mother and her little daughter were excitedly counting out their new spoons and forks. • The parish pro-life director who met, as she prayed outside an abortion clinic, a pregnant mom seeking a late-term abortion for her baby, who had been given a fatal diagnosis. Without calling home, the parish director offered to adopt the child. She and her husband did adopt him and cared for him around the clock until his death a year later. • The woman moved to share the church’s good news about the dignity of women with homeless women in a large Catholic shelter; the priest in charge invited her, knowing that the poor need food for the soul too. The people of God in action—this is what I saw. There is immense beauty here for those open to it. I came home from every adventure with new energy and determined to “keep faith” with these living witnesses. You might say that my experience is anecdotal. Yet it’s also 30 years long and far-flung. My point is this: Catholics in action are not divided the way some in the press often portray us, or even as we sometimes imagine ourselves to be. Catholics’ true “opponents” are all the “-isms” obscuring God or luring us away from being a woman or man for others: materialism, individualism, sexual expressionism, elitism, careerism—whether inside or outside the church. Our opponents are not other Catholic pilgrims who are in conscientious conversation with God, working to help human beings in need. This remains true even if some pilgrims are overly attracted to the shiny object of politics. Often I’ve thought that it might go a long way if Catholics at least managed to avoid two political tics: speaking as if a particular candidate or party embodied Christ-like love for all people; and forgetting how many proposed laws are a complex mix of good and bad. In a more benevolent vein, Catholics might even ponder with affection the traits held in common by Catholics brimming with passion about all sorts of social justice issues. It could be an accident of birth (for example, our moms marched for civil rights or volunteered at a crisis pregnancy center) or a chance encounter with people along the way that set us on the trail of the particular issue that seized our life. This is my “good Samaritan theory” about God strewing certain issues across certain paths. But no matter how it happened, it is good and right to cheer on one another’s works of charity, to cross-donate, to speak warmly about one another—even while we still disagree over the political means to achieve certain ends. All of which is to say that even 30 years of intense “familiarity” with the church has yet to sour me; on the contrary, it calls me toward continual conversion and a higher road. Unless we let each other and the world know about good things people do, especially Catholics, our neighbors will hear too much about that which is banal, ignoble or sinful. Very good and well expressed. Thank you for your insights and thoughts. Great article. I love these two lines, good to keep in mind: "Our opponents are not other Catholic pilgrims who are in conscientious conversation with God, working to help human beings in need. This remains true even if some pilgrims are overly attracted to the shiny object of politics." This was a touching and hopeful article. I also appreciate the comment below about the solidarity we hold with our brothers and sisters in the Catholic faith who work with goodwill to alleviate human suffering, respect life in all of its variations and stages of development, and to extend the mercy of Christ to the larger world. That was beautiful. I'm forwarding it to my adult children, who I think get pulled into divisive politics. Thanks. Yes. And yet, is it unimportant that there's nothing uniquely Catholic about any of this? This article also appeared in print, under the headline "Familiarity Breeds Content," in the June 9-16, 2014 issue. 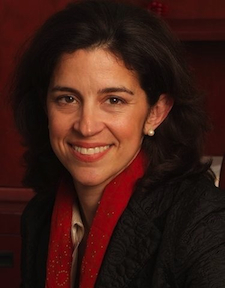 ​Helen Alvaré is a professor of law at George Mason University, where she teaches law and religion and family law. She is also a consultor to the Pontifical Council for the Laity.